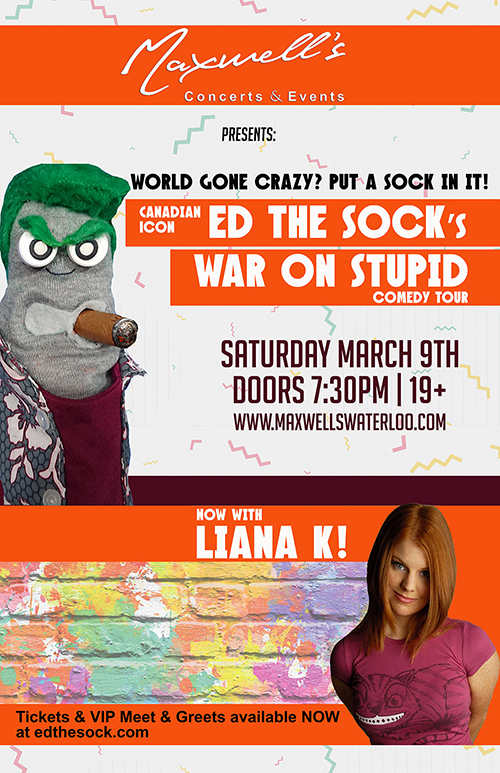 Ed The Sock: War on Stupid Comedy Tour, Saturday March 9th! Canadian icon Ed the Sock, star of the longest-running Canadian TV late-night show and game-changer at Muchmusic (when it was good), has always been the one to call ‘bullsh*t’ on media, celebrities, politicians, big business and others who deserve it. Fearlessly speaking truth to power, Ed uses sharp incisive humour to bring the famous & infamous down to our level, cutting through the spin and saying what we all think, but out loud. Ed has returned to fight “The War on Stupid” turning his surgical wit on Fake News, outrage culture and North America’s growing love affair with idiocy. And in addition to excoriating modern ignorance, Ed unveils video clips of his interviews with celebrities & classic Muchmusic moments, revealing the backstage stories behind them and reminding us of what media looked like when the world still made sense. Let’s face it – we need Ed the Sock now more than ever. And he’s back to save us all! This is a SEATED event!